An old, widely ramified family counting many rabbis among its members, who were and are still found in Italy, Poland, Germany, Alsace, and also in America. It derived its name from the locality of Katzenelnbogen in the Prussian province of Hesse-Nassau. In 1312 Count Diether of Katzenelnbogen received permission from Emperor Henry VII. to keep twelve Jews at Katzenelnbogen; and Ludwig the Bavarian in 1330 permitted Count Wilhelm and his heirs to keep twenty-four Jews in their dominions (Böhmer, "Regesten," No. 501; Wiener, "Regesten," pp. 23, 33). German Talmudist of the eighteenth century. Katzenellenbogen had been a wealthy merchant, but, having been impoverished by a fire, he accepted the office of preacher at Sachtschew. He wrote, in 1784, a work entitled "Birkat Abraham," a philosophical commentary on Ecclesiastes (Warsaw, 1815). In this work he mentions two unpublished works, "Yen ha-Reḳaḥ," a mystical commentary on Esther, and "Darke No'am." Polish rabbi; born about the beginning of the eighteenth century; died after 1787. His father was the son of Ezekiel Katzenellenbogen, rabbi of Keidani, Lithuania, and later of the Three Communities (Altona-Hamburg-Wandsbeck). In 1726, when Abraham was in Wilna, living under the roof of his father-in-law, Joseph Etkes, he met there the child Elijah b. Solomon, who later became the famous gaon. Abraham took young Elijah home with him to Keidani to his father's house, and kept him there several months. In 1746 Abraham was rabbi of Slutsk, and at the synod held at Mir, in 1752, signed, as rabbi of Slutsk, the proposition to excommunicate R. Jonathan Eybeschütz. He became rabbi of Brest-Litovsk about 1760, and his name occurs in the approbations to various works, the latest being dated 1787. He had seven sons, one of whom, Joseph, succeeded him as rabbi of Brest-Litovsk and was in turn succeeded by his son Aryeh Löb Katzenellenbogen. A "hesped" or sermon preached on the occasion of Abraham's death is contained in Eliezer ha-Levi's "Reaḥ ha-Sadeh" (Shklov, 1795). Eisenstadt-Wiener, Da'at Ḳedoshim, pp. 14-15. Polish rabbi; born in 1549; died at Lemberg April 30, 1637; grandfather of Ezekiel Katzenellenbogen, author of "Keneset Yeḥezḳel." Together with his brother Mattithiah Liebermann he studied under his uncle Isaac Katzenellenbogen, rabbi of Neustadt, and author of "Moledot Yiẓḥaḳ." At first rabbi of Yanow, near Lemberg (c. 1593), he was elected in 1615 at Lemberg, to succeed Moses Ḥarif, who, recognizing Katzenellenbogen's scholarship, voluntarily resigned. Katzenellenbogen remained in Lemberg till his death. Some of his novellæ are quoted in "Birkat Ṭob" by R. Moses of Metz, and he is mentioned in the responsa of Meïr of Lublin and in the "Etan ha-Ezraḥi" of Israel Jehiel Rapoport. Eisenstadt-Wiener, Da'at Ḳedoshim, pp. 87, 92, 93. Russian rabbi; born at Brest-Litovsk, where he died Aug. 13, 1837. Both his grandfather and father were rabbis there; he succeeded the latter in 1797, while still a young man, and held the position until his death. He was considered one of the great rabbis of his time. He left no written works, but his name is found appended to a large number of approbations to works of contemporary authors. His signature is second on the resolution adopted by the convention that assembled at Wilna in 1818 to select, by order of Alexander I., three Jewish deputies to reside in St. Petersburg as representatives of the Jews. Fuenn, Ḳiryah Ne'emanah, pp. 35, 47-48, Wilna, 1860. Rabbinical author of the eighteenth century; a pupil of Samuel Heilman and later rabbi of Samter, Prussia. He wrote: "Or Ḥakamim" (Frankfort-on-the-Oder, 1752) and "Leb Ḥakamim," both novellæ (the second ed. of the latter was republished, with additions, at Dyhernfurth in 1773); and "Menorat Zahab," a general title, the work including "Or 'Olam," commentary on the Pentateuch, "Or Ḥadash," commentary on the Hafṭarot, and "Or Torah," sermons on the Pentateuch (ib. 1775). Zedner, Cat. Hebr. Books Brit. Mus. p. 410. Polish-German rabbi; born in Lithuania about 1670; died at Altona July 9, 1749. At first rabbi at Keidani, he was called to Altona in 1714. This call he owed to the efforts of Issachar Kohen, an influential member of the Altona congregation; and Katzenellenbogen in return secured the election of Issachar Kohen's son-in-law to the rabbinate of Keidani. Jacob Emden, who reports this story in his "Megillat Sefer" (pp. 121-140), seems, however, to have been prejudiced against Katzenellenbogen, whom he describes as a man of very low moral character, an ignoramus, and a poor preacher. 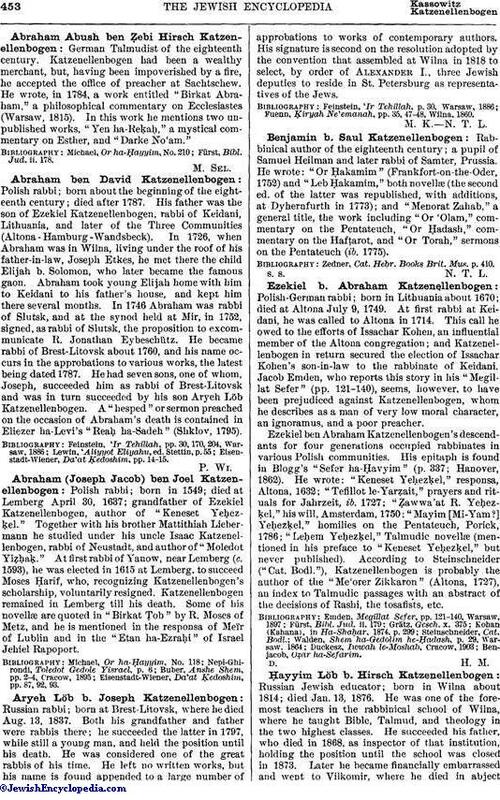 Ezekiel ben Abraham Katzenellenbogen's descendants for four generations occupied rabbinates in various Polish communities. 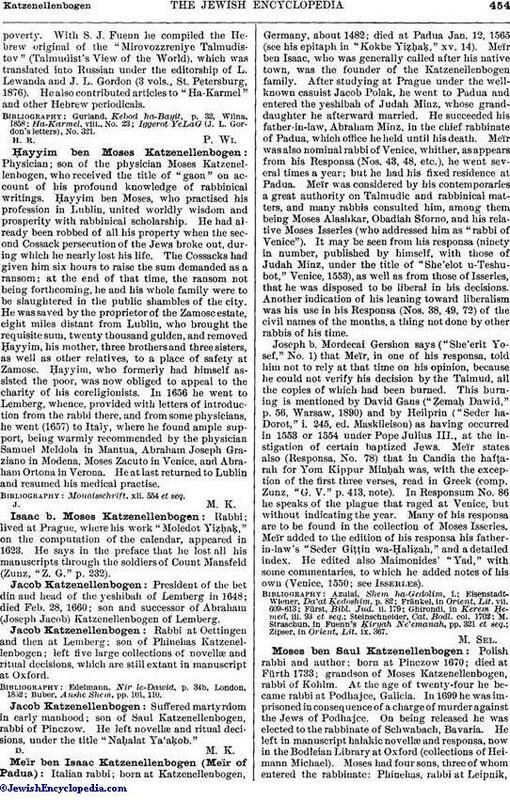 His epitaph is found in Blogg's "Sefer ha-Ḥayyim" (p. 337; Hanover, 1862). He wrote: "Keneset Yeḥezḳel," responsa, Altona, 1632; "Tefillot le-Yarẓait," prayers and rituals for Jahrzeit, ib. 1727; "Ẓawwa'at R. Yeḥezḳel," his will, Amsterdam, 1750; "Mayim [Mi-Yam?] Yeḥezḳel," homilies on the Pentateuch, Porick, 1786; "Leḥem Yeḥezḳl," Talmudic novellæ (mentioned in his preface to "Keneset Yeḥezḳel," but never published). According to Steinschneider ("Cat. Bodl. "), Katzenellenbogen is probably the author of the "Me'orer Zikkaron" (Altona, 1727), an index to Talmudic passages with an abstract of the decisions of Rashi, the tosafists, etc. 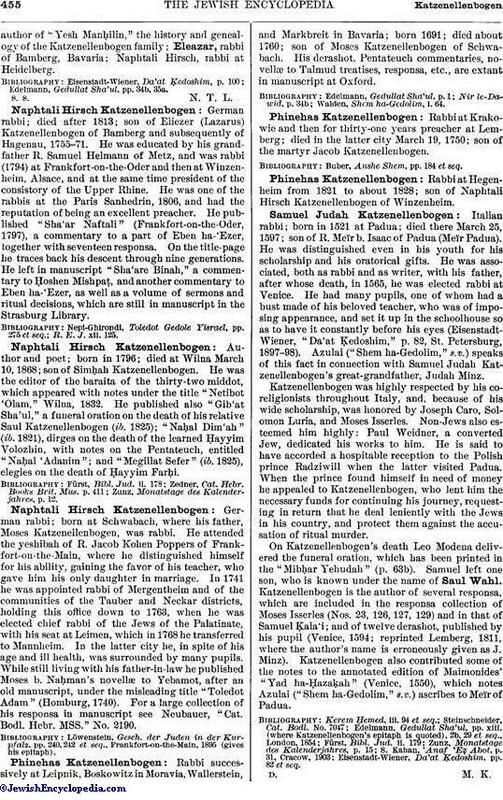 Russian Jewish educator; born in Wilna about 1814; died Jan. 13, 1876. He was one of the foremost teachers in the rabbinical school of Wilna, where he taught Bible, Talmud, and theology in the two highest classes. He succeeded his father, who died in 1868, as inspector of that institution, holding the position until the school was closed in 1873. Later he became financially embarrassed and went to Vilkomir, where he died in abjectpoverty. 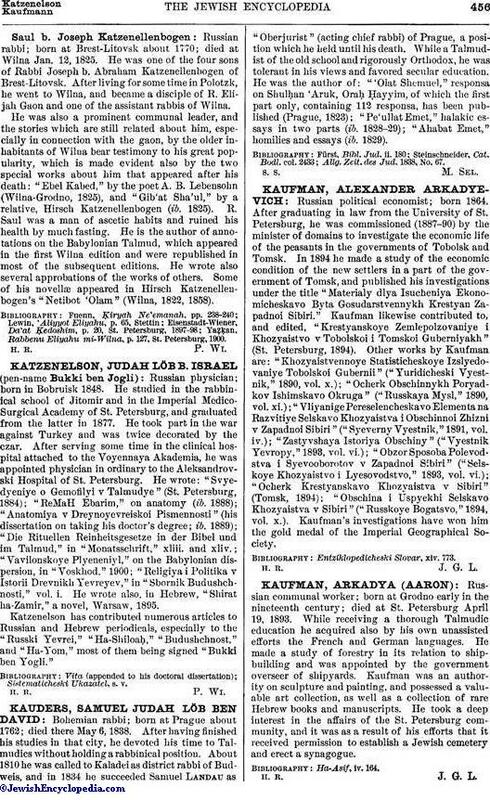 With S. J. Fuenn he compiled the Hebrew original of the "Mirovozzreniye Talmudistov" (Talmudist's View of the World), which was translated into Russian under the editorship of L. Lewanda and J. L. Gordon (3 vols., St. Petersburg, 1876). He also contributed articles to "Ha-Karmel" and other Hebrew periodicals. Iggerot YeLaG (J. L. Gordon's letters), No. 321. Physician; son of the physician Moses Katzenellenbogen, who received the title of "gaon" on account of his profound knowledge of rabbinical writings. Ḥayyim ben Moses, who practised his profession in Lublin, united worldly wisdom and prosperity with rabbinical scholarship. He had already been robbed of all his property when the second Cossack persecution of the Jews broke out, during which he nearly lost his life. The Cossacks had given him six hours to raise the sum demanded as a ransom; at the end of that time, the ransom not being forthcoming, he and his whole family were to be slaughtered in the public shambles of the city. He was saved by the proprietor of the Zamosc estate, eight miles distant from Lublin, who brought the requisite sum, twenty thousand gulden, and removed Ḥayyim, his mother, three brothers and three sisters, as well as other relatives, to a place of safety at Zamosc. Ḥayyim, who formerly had himself assisted the poor, was now obliged to appeal to the charity of his coreligionists. In 1656 he went to Lemberg, whence, provided with letters of introduction from the rabbi there, and from some physicians, he went (1657) to Italy, where he found ample support, being warmly recommended by the physician Samuel Meldola in Mantua, Abraham Joseph Graziano in Modena, Moses Zacuto in Venice, and Abraham Ortona in Verona. He at last returned to Lublin and resumed his medical practise. Monaisschrift, xli. 554 et seq. Rabbi; lived at Prague, where his work "Moledot Yiẓḥaḳ," on the computation of the calendar, appeared in 1623. He says in the preface that he lost all his manuscripts through the soldiers of Count Mansfeld (Zunz, "Z. G." p. 232). President of the bet din and head of the yeshibah of Lemberg in 1648; died Feb. 28, 1660; son and successor of Abraham (Joseph Jacob) Katzenellenbogen of Lemberg. Rabbi at Oettingen and then at Lemberg; son of Phinehas Katzenellenbogen; left five large collections of novellæ and ritual decisions, which are still extant in manuscript at Oxford. Buber, Anshe Shem, pp. 101, 110. Suffered martyrdom in early manhood; son of Saul Katzenellenbogen, rabbi of Pinczow. He left novellæ and ritual decisions, under the title "Naḥalat Ya'aḳob." Italian rabbi; born at Katzenellenbogen, Germany, about 1482; died at Padua Jan. 12, 1565 (see his epitaph in "Kokbe Yiẓḥaḳ," xv. 14). Meïr ben Isaac, who was generally called after his native town, was the founder of the Katzenellenbogen family. After studying at Prague under the wellknown casuist Jacob Polak, he went to Padua and entered the yeshibah of Judah Minz, whose granddaughter he afterward married. He succeeded his father-in-law, Abraham Minz, in the chief rabbinate of Padua, which office he held until his death. Meïr was also nominal rabbi of Venice, whither, as appears from his Responsa (Nos. 43, 48, etc. ), he went several times a year; but he had his fixed residence at Padua. Meïr was considered by his contemporaries a great authority on Talmudic and rabbinical matters, and many rabbis consulted him, among them being Moses Alashkar, Obadiah Sforno, and his relative Moses Isserles (who addressed him as "rabbi of Venice"). It may be seen from his responsa (ninety in number, published by himself, with those of Judah Minz, under the title of "She'elot u-Teshubot," Venice, 1553), as well as from those of Isserles, that he was disposed to be liberal in his decisions. Another indication of his leaning toward liberalism was his use in his Responsa (Nos. 38, 49, 72) of the civil names of the months, a thing not done by other rabbis of his time. Joseph b. Mordecai Gershon says ("She'erit Yosef," No. 1) that Meïr, in one of his responsa, told him not to rely at that time on his opinion, because he could not verify his decision by the Talmud, all the copies of which had been burned. This burning is mentioned by David Gans ("Ẓemaḥ Dawid," p. 56, Warsaw, 1890) and by Heilprin ("Seder haDorot," i. 245, ed. Maskileison) as having occurred in 1553 or 1554 under Pope Julius III., at the instigation of certain baptized Jews. Meïr states also (Responsa, No. 78) that in Candia the hafṭarah for Yom Kippur Minḥah was, with the exception of the first three verses, read in Greek (comp. Zunz, "G. V." p. 413, note). In Responsum No. 86 he speaks of the plague that raged at Venice, but without indicating the year. Many of his responsa are to be found in the collection of Moses Isserles. Meïr added to the edition of his responsa his father-in-law's "Seder Giṭṭin wa-Ḥaliẓah," and a detailed index. He edited also Maimonides' "Yad," with some commentaries, to which he added notes of his own (Venice, 1550; See Isserles). Zipser, in Orient, Lit. ix. 367. Polish rabbi and author; born at Pinczow 1670; died at Fürth 1733; grandson of Moses Katzenellenbogen, rabbi of Kohlm. At the age of twenty-four he became rabbi at Podhajce, Galicia. In 1699 he was imprisoned in consequence of a charge of murder against the Jews of Podhajce. On being released he was elected to the rabbinate of Schwabach, Bavaria. He left in manuscript halakic novellæ and responsa, now in the Bodleian Library at Oxford (collections of Heimann Michael). 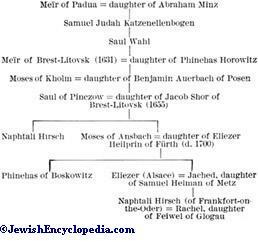 Moses had four sons, three of whom entered the rabbinate: Phinehas, rabbi at Leipnik,author of "Yesh Manḥilin," the history and genealogy of the Katzenellenbogen family; Eleazar, rabbi of Bamberg, Bavaria; Naphtali Hirsch, rabbi at Heidelberg. Edelmann, Gedullat Sha'ul, pp. 34b, 35a. German rabbi; died after 1813; son of Eliezer (Lazarus) Katzenellenbogen of Bamberg and subsequently of Hagenau, 1755-71. He was educated by his grandfather R. Samuel Helmann of Metz, and was rabbi (1794) at Frankfort-on-the-Oder and then at Winzenheim, Alsace, and at the same time president of the consistory of the Upper Rhine. He was one of the rabbis at the Paris Sanhedrin, 1806, and had the reputation of being an excellent preacher. He published "Sha'ar Naftali" (Frankfort-on-the-Oder, 1797), a commentary to a part of Eben ha-'Ezer, together with seventeen responsa. On the title-page he traces back his descent through nine generations. He left in manuscript "Sha'are Binah," a commentary to Ḥoshen Mishpaṭ, and another commentary to Eben ha-'Ezer, as well as a volume of sermons and ritual decisions, which are still in manuscript in the Strasburg Library. R. E. J. xli. 125. Author and poet; born in 1796; died at Wilna March 10, 1868; son of Simḥah Katzenellenbogen. He was the editor of the baraita of the thirty-two middot, which appeared with notes under the title "Netibot 'Olam," Wilna, 1832. He published also "Gib'at Sha'ul," a funeral oration on the death of his relative Saul Katzenellenbogen (ib. 1825); "Naḥal Dim'ah" (ib. 1821), dirges on the death of the learned Ḥayyim Volozhin, with notes on the Pentateuch, entitled "Naḥal 'Adanim"; and "Megillat Sefer" (ib. 1825), elegies on the death of Ḥayyim Farḥi. Zunz, Monatstage des Kalenderjahres, p. 12. German rabbi; born at Schwabach, where his father, Moses Katzenellenbogen, was rabbi. He attended the yeshibah of R. Jacob Kohen Poppers of Frankfort-on-the-Main, where he distinguished himself for his ability, gaining the favor of his teacher, who gave him his only daughter in marriage. In 1741 he was appointed rabbi of Mergentheim and of the communities of the Tauber and Neckar districts, holding this office down to 1763, when he was elected chief rabbi of the Jews of the Palatinate, with his seat at Leimen, which in 1768 he transferred to Mannheim. In the latter city he, in spite of his age and ill health, was surrounded by many pupils. While still living with his father-in-law he published Moses b. Naḥman's novellæ to Yebamot, after an old manuscript, under the misleading title "Toledot Adam" (Homburg, 1740). For a large collection of his responsa in manuscript see Neubauer, "Cat. Bodl. Hebr. MSS." No. 2190. Löwenstein, Gesch. der Juden in der Kurpfalz, pp. 240, 242 et seq., Frankfort-on-the-Main, 1895 (gives his epitaph). Rabbi successively at Leipnik, Boskowitz in Moravia, Wallerstein, and Markbreit in Bavaria; born 1691; died about 1760; son of Moses Katzenellenbogen of Schwabach. His derashot, Pentateuch commentaries, novellæ to Talmud treatises, responsa, etc., are extant in manuscript at Oxford. Walden, Shem ha-Gedolim, i. 64. Rabbi at Krakowie and then for thirty-one years preacher at Lemberg; died in the latter city March 19, 1750; son of the martyr Jacob Katzenellenbogen. Buber, Anshe Shem, pp. 184 et seq. Rabbi at Hegenheim from 1821 to about 1828; son of Naphtali Hirsch Katzenellenbogen of Winzenheim. Italian rabbi; born in 1521 at Padua; died there March 25, 1597; son of R. Meïr b. Isaac of Padua (Meïr Padua). He was distinguished even in his youth for his scholarship and his oratorical gifts. He was associated, both as rabbi and as writer, with his father, after whose death, in 1565, he was elected rabbi at Venice. He had many pupils, one of whom had a bust made of his beloved teacher, who was of imposing appearance, and set it up in the schoolhouse so as to have it constantly before his eyes (Eisenstadt-Wiener, "Da'at Ḳedoshim," p. 82, St. Petersburg, 1897-98). Azulai ("Shem ha-Gedolim," s.v.) speaks of this fact in connection with Samuel Judah Katzenellenbogen's great-grandfather, Judah Minz. Katzenellenbogen was highly respected by his coreligionists throughout Italy, and, because of his wide scholarship, was honored by Joseph Caro, Solomon Luria, and Moses Isserles. Non-Jews also esteemed him highly: Paul Weidner, a converted Jew, dedicated his works to him. He is said to have accorded a hospitable reception to the Polish prince Radziwill when the latter visited Padua. When the prince found himself in need of money he appealed to Katzenellenbogen, who lent him the necessary funds for continuing his journey, requesting in return that he deal leniently with the Jews in his country, and protect them against the accusation of ritual murder. On Katzenellenbogen's death Leo Modena delivered the funeral oration, which has been printed in the "Mibḥar Yehudah" (p. 63b). Samuel left one son, who is known under the name of Saul Wahl. Katzenellenbogen is the author of several responsa, which are included in the responsa collection of Moses Isserles (Nos. 23, 126, 127, 129) and in that of Samuel Ḳala'i; and of twelve derashot, published by his pupil (Venice, 1594; reprinted Lemberg, 1811, where the author's name is erroneously given as J. Minz). Katzenellenbogen also contributed some of the notes to the annotated edition of Maimonides' "Yad ha-Ḥazaḳah" (Venice, 1550), which notes Azulai ("Shem ha-Gedolim," s.v.) ascribes to Meïr of Padua. Eisenstadt-Wiener, Da'at Ḳedoshim, pp. 82 et seq. Russian rabbi; born at Brest-Litovsk about 1770; died at Wilna Jan. 12, 1825. He was one of the four sons of Rabbi Joseph b. Abraham Katzenellenbogen of Brest-Litovsk. After living for some time in Polotzk, he went to Wilna, and became a disciple of R. Elijah Gaon and one of the assistant rabbis of Wilna. He was also a prominent communal leader, and the stories which are still related about him, especially in connection with the gaon, by the older inhabitants of Wilna bear testimony to his great popularity, which is made evident also by the two special works about him that appeared after his death; "Ebel Kabed," by the poet A. B. Lebensohn (Wilna-Grodno, 1825), and "Gib'at Sha'ul," by a relative, Hirsch Katzenellenbogen (ib. 1825). R. Saul was a man of ascetic habits and ruined his health by much fasting. He is the author of annotations on the Babylonian Talmud, which appeared in the first Wilna edition and were republished in most of the subsequent editions. He wrote also several approbations of the works of others. 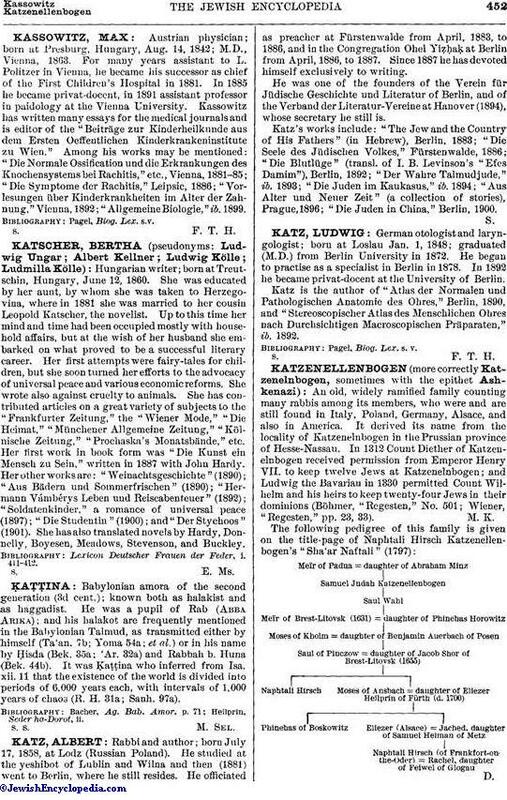 Some of his novellæ appeared in Hirsch Katzenellenbogen's "Netibot 'Olam" (Wilna, 1822, 1858). Yaẓḳan, Rabbenu Eliyahu mi-Wilna, p. 127, St. Petersburg, 1900.